View the entire collection HERE!!! 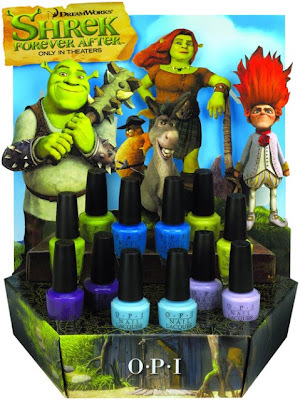 I try not to get too overly excited about new collections (for my poor wallet's sake), but I've got to say - I am insanely ecstatic about OPI's Shrek Forever After collection. I know some people think Shrek and OPI are an odd combination (and I've got to admit - when I first heard about this in February, I thought it was a joke). But I am totally on board now! Seriously, could it be much better than ogres and nail polish? I am a HUGE Shrek fan. Perhaps 'fanatic' is the more correct term. I just love Shrek. I loved the first movie, I adored the second, the third, well, I liked it - but the first two Shrek movies are some of my favorite movies. Ever. Check out the soundtracks as well. The soundtrack for Shrek and Shrek 2 are fabulous. My favorites from the first movie? "I'm a Believer" (Smashmouth), "Bad Reputation" (Halfcocked), "My Beloved Monster" (Eels), "Hallelujah" (John Cale), "I'm on my Way" (The Proclaimers), and more Smashmouth (have I told you I love Smashmouth? ): "All Star." And from Shrek 2: "Accidently in Love" (Counting Crows), "Holding Out for a Hero" (Frou Frou), "Funkytown" (Lipps), "I Need Some Sleep" (Eels), "Ever Fallen in Love" (Pete Yorn), "Holding Out for a Hero" (Jennifer Saunders). And others. Seriously great soundtracks. So you can see why I've been pretty excited about the Shrek Forever collection. It is expected to arrive June 2010, but for now we have some fun pictures to look at :) Yay! Question: Is Fiercely Fiona a yellow creme (as it appears in the individual bottle shot) or a lighter version of Who the Shrek are You? I'm really excited about these colors. So excited that I can't even choose favorites - I totally want them all. How about you? Which shades are you most excited about? View the entire collection and tons of polish swatches HERE! Ooh I'm really excited about this collection too!! I'm not sure what my favorite is though..
Oh really nice! i want purple ones deffinetly! :D thx for sharing! I want this whole collection, and I can't wait! Accidently In Love is one of my favorite songs too! Now I'm gonna have this in my head all day. About the Fiona... This pic got me confused too! Whats up with the color, I expected it to be more like ChG Lemon Fizz... Oh well, I probably end up buying all of them. Can't wait for this collection to come out! I've just received the collection and will try to get swatches posted by the end of the week. I'm happy to see I'm not the only one who loves the soundtracks! Fiercely Fiona is definitely not yellow, a yellowish-green at best, sorry to disappoint you. Holy cow! The first one I grab will be "Who The Shrek Are You"! As long as it is a lime green like in the photo and not a dirty yellow as it seems in the illustration. Then probably the light blue... but I'm sure they will ALL end up in my OPI pile before the summer is over! is it just me or shouldnt the Shrek/Fiona colours be green? or at least have a green in the collection?? its shrek! I'm confused. OOOO, I LOOOOVE these colors! Jessica - that is the song J and I plan to have our first dance together to at our wedding :) I love it!! Lacquerista - I'm in the same boat as you - I was expecting a lemon yellow (although "What's with the Cattitude" would have made a GREAT yellow, IMO). It's starting to look like we aren't getting any yellows here! Thanks for the info chocaddict!! I can't wait to see your swatches :) Glad you love the soundtracks too! Thanks for all the great comments everyone :) I read them all and LOVE hearing your opinions!!! I'm looking forward to this collection coming out and seeing everything in person, there are a few colours I think I might like. June seems so far away though! Yellow is not great on me, but I'm excited about the purples! I like the who the shrek are you the most it reminds me of the spring green crayola color! I am sooooo excited about this new collection, I love the bright colors!